New Zealand enjoys a moderate climate, without extremes of hot or cold. This is due not only to the latitude of the country but to the fact that most of New Zealand's landmass is relatively close to the sea. Having such a maritime climate there is an abundance of sunshine and pleasant temperatures for most of the year. New Zealand's long narrow shape is dominated by two main geographic features—the proximity of the sea, and mountains (the most famous of the latter are the Southern Alps which traverse almost the entire length of the South Island). The North and South Islands have quite different geographic features and this is reflected in the climate as well. On both islands there tends to be a marked difference in the weather between the eastern and western sides. The prevailing wind is westerly, so on that coast, the beaches are generally wild and rugged with stronger winds. The eastern coast is much milder, with sandy beaches good for swimming and a generally lower rainfall. In the far north of the North Island, summer weather can be almost tropical, high in humidity and temperatures as warm as 95 F (35 C). Winter temperatures are rarely much below freezing on this island, apart from the inland mountain regions in the middle of the island. In any season, the North Island can receive quite high rainfall, which accounts for the country's lush green environment. Northland and Coromandel have higher than average amounts of rain. The Southern Alps neatly divide the east and west coasts. South of Christchurch snow is common in the winter. Summers can be hot in the South Island although changeable, due to the proximity of the mountains. Everything is around the other way in the southern hemisphere: it gets colder the further south you go, and summer is over Christmas and winter is in the middle of the year. A barbecue on the beach on Christmas Day is a long-held kiwi tradition that confuses many a visitor from the northern hemisphere! Rainfall in New Zealand is reasonably high, although more so in the west than in the east. Where there are mountains, such as along the South Island, it causes the westerly weather to cool and precipitate into rain. That is why the west coast of the South Island is particularly wet; in fact, Fiordland, in the south-west of the South Island has amongst the highest rainfall of anywhere on earth. New Zealand enjoys long sunshine hours in most places and at most times of the year. There is not a huge difference in daylight hours between the summer and winter, although it is more accentuated in the south. In the North Island, daylight hours are generally from around 6 a.m. to 9 p.m. in the summer and 7:30 a.m. to 6 p.m. in the winter. In the South Island add an hour to the summer at each end of the day and subtract one in the winter for a very rough guide. A word of warning about the New Zealand sunshine: New Zealand has the highest incidence of skin cancer in the world. The sun can be rather harsh and burn times are short, especially in the summer. It is essential to apply a high-protection sunblock in the summer months. Any time of year is a good time to visit New Zealand; it all depends on what you are wanting to do. The majority of tourists tend to favor spring, summer, and autumn (fall). However the quieter months of winter (June to August) can be a wonderful time for snow-based activities such as skiing and snowboarding and the South Island, in particular, is spectacular in the winter. Auckland's subtropical climate is characterized by warm, humid summers and cool, wet winters. The city is one of New Zealand's warmest and sunniest, with an average daily temperature of 75 F (24 C) in February. In winter, temperatures are slightly cooler, averaging 59 F (15 C) in July. The city receives significant rainfall year-round, usually upwards of 40 inches, but snowfall is extremely rare. Rotorua is situated on a lake on New Zealand's North Island. It experiences a warm, temperate climate with nearly 60 inches of rainfall annually. The average year-round temperature in Rotorua is 55 F (12 C), but winter temperatures can fall as low as 45 F (8 C). July is Rotorua's coldest month, while February is the warmest. Wellington experiences a marine climate with temperatures rarely exceeding 77 F (25 C) or dropping below 39 F (4 C). During the winter months, the city receives southerly blasts which can make it feel much colder than it actually is. June and July are the wettest months in Wellington, and the city receives 49 inches of rain per year. Unlike much of the rest of New Zealand, Wellington does occasionally receive snow, most recently in July and August 2011. Christchurch has a mostly warm, oceanic climate with a sea breeze from the northeast. Temperatures usually average around 73 F (23 C) as a high and 52 F (11 C) as a low. During the winter months, the city experiences frost and occasional snowfall isn't uncommon. Smog is a frequent occurrence in Christchurch, especially during the winter when vehicle exhaust and smoke get trapped above the city. 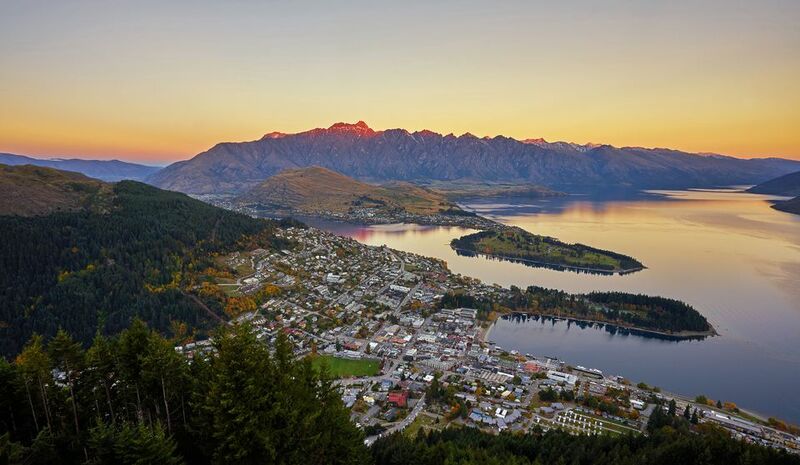 Queenstown is among New Zealand's warmest city, reaching close to 86 F (30 C) during the summer months. Winters, however, are equally as cold with single-digit temperatures and snowfall. Queenstown is much drier than other parts of New Zealand, receiving just 29 inches of rain annually. The spring months in New Zealand are technically the country's autumn. These are the month when the country's natural bounty is at its best as kiwis are harvest and forests blossom with unique flora. Temperatures rarely exceed 66 F (19 C) and don't usually drop below 46 F (8 C). What to Pack: Depending on where you'll be visiting, pack light layers that can be removed easily—or added on to. While it rains often in New Zealand, you'll still want to protect yourself from the sun with either a good hat or a high SPF sunscreen. New Zealand has among the highest instances of skin cancer in the world. New Zealand's winter takes place in the traditional summer months. With it comes harsh winds and sometimes heavy snowfall in mountain areas. Still, across much of the country, the climate remains reasonably mild, rarely dipping below 40 F (4 C). What to Pack: If you're visiting the during the winter, pack lots of layers, including a sweater, jacket, raincoat, and umbrella. On the South Island, you'll need a down jacket, a scarf, and a hat as well. New Zealand experiences its spring from September through November. Weather during this time can be quite variable, ranging from cold with frequent frosts to hot and sunny. This is the time to visit if you're interested in spring buds and frolicking lambs. It's also a popular season for white-water rafters, as melting snow increases river levels. What to Pack: Given the season's unpredictability, you'll want to pack clothing prepared for all sorts of weather. Layers in the form of long-sleeve T-shirts, sweaters, and a pullover or jacket are always a good idea, as is an umbrella. New Zealand's summer spans from December through February. The season is punctuated by long, sunny days and warm temperatures, with cooler nights. This a popular season among travelers, as the weather is ideal for everything from hiking to beachgoing to surfing. Popular wine region Marlborough hosts its namesake festival every February, celebrating the best of New Zealand's Rieslings, Chardonnays, Sauvignon Blancs, and more. What to Pack: During the day, light clothes are recommended—with a healthy dose of sunscreen. At night, bring along a sweatshirt or light jacket to weather the cooler temperatures.